Reaching on time is one of the most crucial goal for sales and service field reps. Field Reps spend more time in traffic and traveling than meeting and appointments with the customers or prospects. The key to success in increasing productivity of salesperson is to reach more clients while optimizing travel time, mileage, and saving cost. 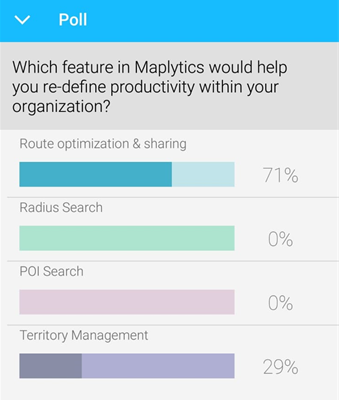 As per poll was taken in one of our recent webinars, Route optimization is one of the most used and loved feature by sales and service field reps of maps integration in Dynamics 365 CRM. It not only allows you to Save Time, Fuel but a client as well. Maplytics goes a step further from route optimization, it also helps sales reps to save and share optimized routes with colleagues via email. In addition to this user can add multiple appointments to a route in a single click from the map itself. Further user can access those Navigation Links to visit those waypoints and get turn-by-turn navigation on the Google Maps app on their mobile or tablet devices. And if any customer cancels a meeting at the last moment, Maplytics can help sales reps find another customer along the route. In addition, it also helps Sales Managers to chart out routes for their Sales Reps and to get the bigger picture of their Sales Territories by managing and optimizing their opportunity activities, all this and many more features clubbed together in Maplytics – a featured app on Microsoft AppSource. There are several scenarios where inside sales representatives book appointments within Dynamics CRM while field representatives have to visit these customers. Co-ordination between field salespeople and inside salespeople plays a crucial role in such situations. Maplytics can help in such situations with it’s Save and Share route functionality. 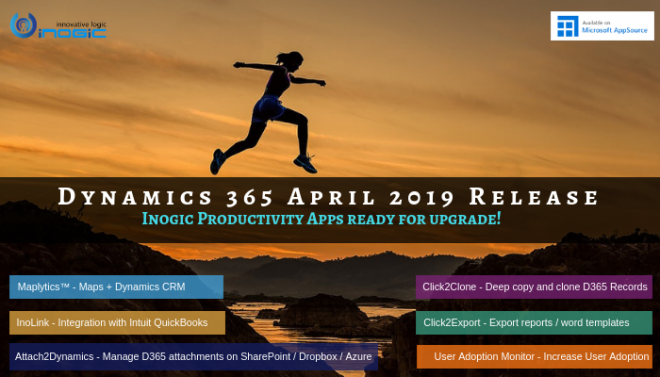 This functionality enables Dynamics 365 users to save scheduled routes as a Dynamics CRM activity, which can be shared through an email as well. This way, sales reps can schedule multiple appointments with customers, create an optimized route for it, and share it with his associate field sales person via email. To help users be productive at every stage of route planning & optimization, we have added a ‘Add to Route’ mass action. With the addition of ‘Add to Route’ mass action, when Sales Reps plot their appointments for the day on a map within Dynamics 365, they can simply use the ‘Add to Route’ mass action and add the data points to the route simultaneously, in a single click. Read more about this feature in this blog. Previously, Maplytics users would just perform a proximity search to find the nearby records, but having to do this every time was something that we didn’t want the user to do. So, with Maplytics March 2018 release, we came up with an awesome new feature which brings the best of routing and proximity search together, and we call it ‘Along the Route Search’ all this within your Dynamics CRM itself. Along with Route Optimization, saving and sharing routes has become the necessity for every sales and service professional. However, previously when the user created a route in Maplytics, the route and plotted data were stored on different layers and the user had to switch between the Plot and Directions Card to view the plotted data and the route respectively. With the Maplytics March 2018 release sales & field service reps will have a better control on their routes, as we have added a small enhancement to this. With this release, Maplytics users will be able to merge both the layers which makes it easier for users to have their data and routes on one screen! In our recent release of Maplytics, we added an option to access Navigation links on Dynamics 365 App for Phones and Tablets, it would now redirect them to the Google Maps App on their mobile or tablet. By having the ability to get the turn-by-turn navigation from within Dynamics 365 on to the Google Maps app further improves the mobility of the Field Sales and Service Reps and helps them to achieve more when on the field. Read our blog to know how this works. Get your free TRIAL today from our Website or Microsoft AppSource! Maplytics™ is one of the leading geo-analytical mapping apps that provides powerful routing capabilities within Microsoft Dynamics 365. Maplytics is one of the first multi-language mapping apps to be Certified for Microsoft Dynamics 365 (CfMD). 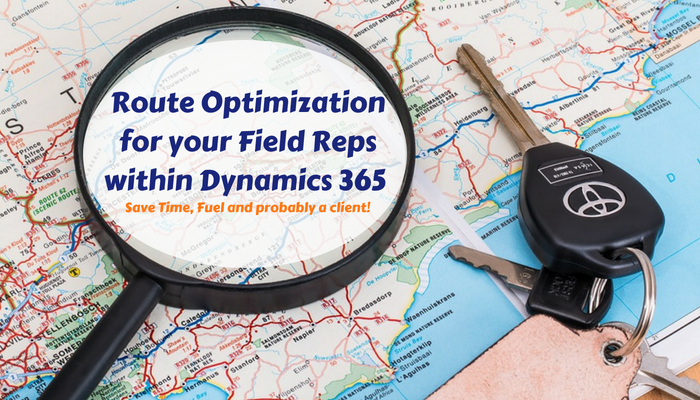 Apart from Route Planning and Optimization capabilities, Maplytics offers powerful features like Appointment Planning, Radius Search, Territory Management, Heat Maps and more to take your MS Dynamics CRM visualization to an entirely new level! Maplytics currently supports English, French, German, Portuguese, Spanish and Turkish.